In order to extract the maximum recovery value from the organic waste input, the digestate from anaerobic digestion should be used for a useful purpose and positive benefit should be derived from its production. Digestate from anaerobic digestion should be used for a useful purpose and positive benefit should be derived from its production. Digestate from anaerobic digestion should be used for a useful purpose and positive benefit should be derived from its production. Indeed, given that the disposal of liquids to landfill is now prohibited by the EU wide waste regulations, digestate not disposed usefully to land would need treatment. That treatment would in most cases, such as for example, aerobic biological treatment as an industrial effluent, incur a substantial energy input tending to add a sacrificial energy demand on the process and negate the sustainability of biogas production. The UK Instiutute of Wastes Management’s, Anaerobic Digestion Working Group which reported in May 1998 provided information on the quality, of digestate produced by a number of AD Plants which were operational at the time. In practice, the uses reported varied from use as landfill cover material, through direct application of the digestate to land for agricultural benefit, to further maturation and refinement of the digestate to produce a quality soil conditioner. 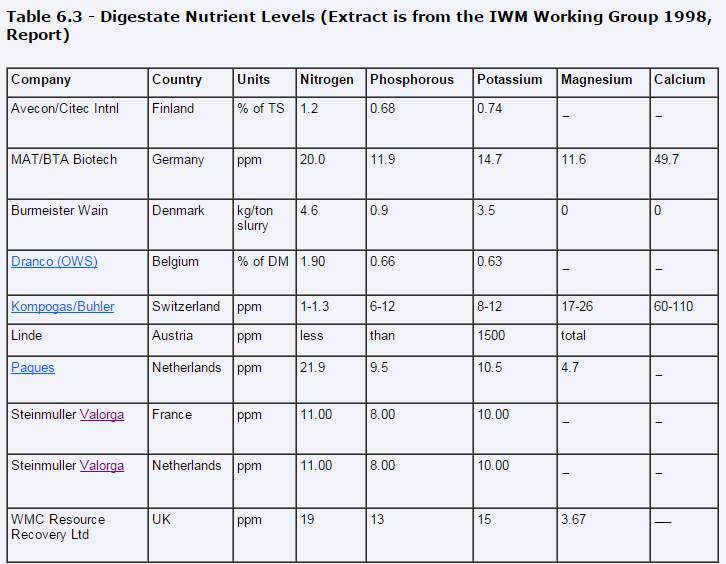 At the time of the IWM working group’s investigation, the digestate from all of the plants studied was reported to be exported from the plant for use. However, in half of the cases no revenue was received for the digestate. In general it was used as a soil conditioner or fertiliser, all but for one plant where the use was in horticulture. Then, as now, the presence of heavy metals in the digestate from mixed MSW digestion can be an important factor in restricting its use. 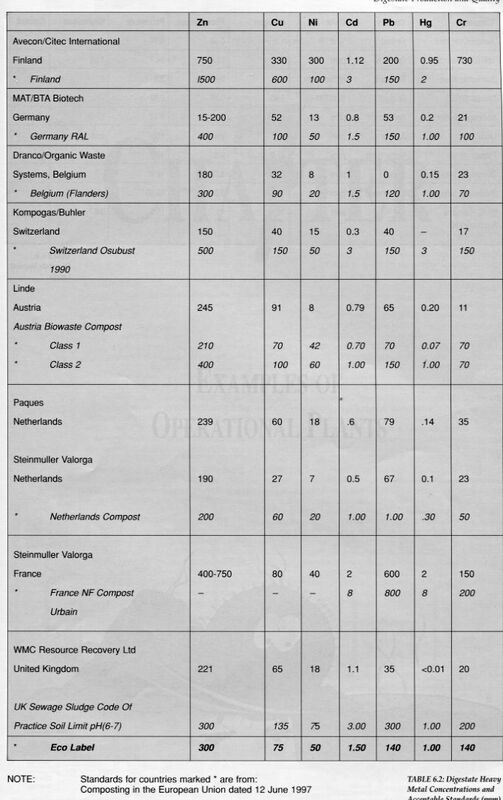 IWM, Table 6.2 (see below) which has been extracted from the report summarises the information supplied by the various companies which contributed to the report, together with an appreciation of the levels which are acceptable in the country of production where the digestate is used as a soil conditioner. The level of nutrients in the digestate is, also of course, of fundamental importance to its suitability as a soil conditioner. Table 6.3 (see below) is a summary of the information from the report, from the companies concerned. From this it can be seen that digestates from the anaerobic digestion of MSW provides a useful level of organic fertilisers which would in the right circumstances, as part of a programme of application with soils monitoring, over a number of years, improve soil structure and reduce the requirement for the addition of inorganic fertilisers. The acceptable levels for rates of fertiliser application, and the level of tolerance of heavy metals, still does vary for each country. Application rates are however, universally regulated and monitored to avoid the build up of heavy metals in the soil to toxic levels. Although, until 2011 the author’s view is that in the UK only about 50% of digestate produced in the UK was earning any revenue for the AD Plant operator, the position is now changing with the introduction of “end-of-waste” protocols by the Environment Agency (England and Wales), and the adoption of the PAS110 quality standard which applies to only the cleanest waste in the from of source segregated organic waste. Really did appreciate the angle and detailed info in this post. Really looking forward to read more.